WASHINGTON — The gooey, grayish-black sludge that spread across Roane County on a bitterly cold December morning is gone, but the fallout from the nation's worst coal-ash spill enters a new phase on Monday when the federal government begins regulating the storage and disposal of ash from coal-fired power plants. Effective immediately, utilities will be required to put in place a plan to control "fugitive" dust, or ash that blows away while it's being transported or stored and could end up in streams. Within 30 days, those dust-control plans must be posted online so they are available for review by the public. Utilities must immediately begin inspections of coal-ash storage ponds and landfills and post the results of those inspections online as well. Storage sites under construction will have to meet new design standards that require safeguards such as liners and restrict how close they can be to groundwater tables, seismic zones, flood plains and unstable areas such as sinkholes. A year from now, utilities will have to determine whether existing storage ponds meet mandatory safety standards. Within two years, a groundwater monitoring system must be installed at coal-ash sites, and other measures will have to be taken to protect nearby water resources. "We've already seen the beginning of utilities starting to comply with the regulations," said Lisa Evans, an attorney for the environmental watchdog group Earthjustice. The new rules, announced last December and effective today, mark the first time the federal government has regulated coal-ash storage and disposal and come after years of lobbying and a lawsuit by environmental groups. 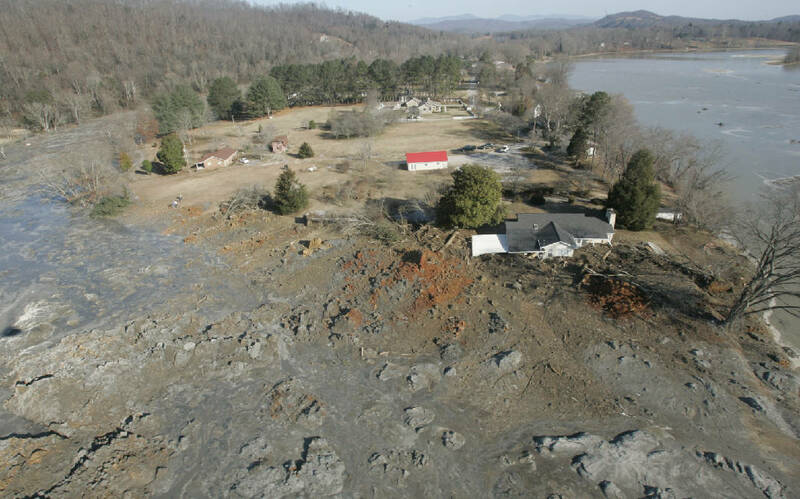 The federal government will regulate coal ash as household garbage instead of as a hazardous material, a tougher standard that would have required the phase-out of wet storage ponds like the one that ruptured in Roane County. But while the new standards fall short of what environmentalists had sought, they are an improvement, Evans said. Until now, regulation of coal ash had been left up to a patchwork of state rules that varied from one state to another. The new regulatory scheme requires states to adopt the federal regulations as minimum standards, but still leaves enforcement up to the states. Residents who believe the standards are not being followed could sue to force utilities to comply. "The rule is a weak rule," Evans said, "but it is a national rule that all utilities must comply with. This is a small step forward, and we're better off than we were last year. But there's a lot of work to be done." The U.S. Environmental Protection Agency says the new rule will protect public health. Parts will indeed be beneficial for communities, particularly the standards requiring groundwater monitoring and dust control around coal-ash sites, said Jonathan Levenshus, the Tennessee representative for the Sierra Club's Beyond Coal Campaign. "Our view is that there are some helpful tools for citizens seeking to address the risks and problems associated with the disposal of coal ash at these sites," he said, but "we're disappointed that it allows utilities to continue disposing of coal ash in ponds and does not incorporate strong federal enforcement. "The standard leaves people to fend largely for themselves against utilities." Although it took nearly seven years to get them enacted, the new rules resulted from the catastrophic coal-ash spill in Roane County. Just after midnight on Dec. 22, 2008, a storage pond at the Tennessee Valley Authority's Kingston Fossil Plant ruptured, setting loose a cascade of 5.4 million cubic yards of coal-ash slurry that polluted the Emory River, damaged nearby homes and property and necessitated a cleanup that cost more than $1.13 billion. The cleanup is done, but monitoring of the environment around the site will continue until 2017 and on a smaller scale afterward, the EPA said at a public hearing in Kingston in June. In anticipation of the coming federal rules, TVA has been "aggressively" taking action over the past five years to get ready, said Scott Brooks, the utility's spokesman. TVA, the nation's largest public utility, already has begun phasing out wet storage ponds like the one used in Kingston and converting to dry storage sites. The conversion, projected to cost between $1.5 billion and $2 billion, started after the Kingston spill and includes projects to address the primary requirements of the new federal rules, Brooks said. "We expect that process to be complete in the next 10 years," Brooks said. TVA's overall response to the new federal rules is still in process and will depend in part on how the rules are applied in the seven states in which the utility operates, Brooks said. Contact Michael Collins at michael.collins@jmg.com or 202-408-2711.